The White Eagle Cafe, is it haunted? 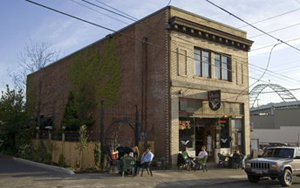 The building known as the white eagle cafe was originally a saloon which was established in 1905 in an earlier 1880s wood framed structure at this location. The present simple brick two-story structure was completed in 1914, replacing the old commercial building. Barney Soboleski and William Hryszko, who were Polish immigrants, established the new business. The building today remains as a cafe. The White Eagle cafe consists of two stories and during this time, the upstairs was a brothel filled with white women and the basement was a brothel filled with black and Chinese women. There was one girl who worked in the brothels by the name of Rose. Rose was well-known throughout the brothels as she was considered to be the sole property of the owner of the brothel. There was one customer however who fell deeply in love with Rose and begged her to leave her world of abuse and run away with him. Rose was far too frightened to stand up to her owner and so she refused the man. He became very angry and stabbed her in one of the upstairs bedrooms. Rose had most likely spent a lot of time in the bedroom that she was killed in and it seems as though she has chosen to live out the rest of her spirit life there as well. Rose constantly wanders around the upstairs level of the once-ago brothel and she particularly likes to spend time in the room that was the setting for the last moments of her life. Some guests while staying there have claimed that they have been approached by Rose during their stay and that she has propositioned them while there. There is another spirit who once inhabited the white eagle cafe as an earthly form but this time, it’s a man that has decided to stick around. His name is Sam and he was brought into the home as a young boy and lived and grew up there, doing odd jobs around the home. He still called the house his home until he was an old man and even now his shadow can sometimes be seen on the exterior of the home as well as around certain areas of the home. Sam’s bedroom was kept as a sort of shrine to him after his death and although it still remains very similar to the way Sam kept it while he lived there, there have been miscellaneous items found taken out of his bedroom and placed in other rooms. One of the previous owners decided to close the upstairs off entirely when he could no longer enter the bedrooms up there. It seems that the doors to the rooms would all stand wide open, apparently ready to welcome visitors but whenever he was about to enter one, the door would close and it would feel as though someone was pushing and holding it shut from the other side. The basement was where the real horror of the salon lay. It was here that the black and Chinese women were kept as slaves and used as prostitutes to make money for the owners of the saloon. But not only women suffered here. Men were also sent through tunnels so that they could be sold as ship hands to the river just a little ways away. Besides the fear, anger and sadness that can be felt just standing in the basement, other strange happenings have occurred here including a waitress that was pushed downstairs, seemingly by no one, coins falling from ceiling, and earthquakes that seemed to only affect the building. There’s no doubt that the White Eagle Café has a very sad history and there are still inhabitants here that want to make sure that that history is known!